Okay, then. I'll ask some questions. 1.How would you obtain the "Var" beam in Super Metroid? 3.There is some secret dialogue in Metroid Fusion. How do you get to it and what is basically said in the dialogue? 4. I think he's looking for the name of the Luminoth. U Mos I think. *gustavo.gratacos - The first two are correct. Number four is the race of the character, but I was looking for his name. Did she need them to breed Metroids? 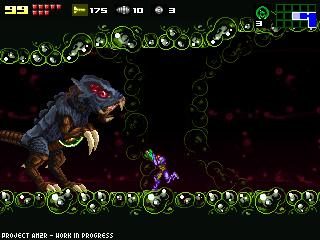 A - The Space Pirates needed Mother Brain's ability to use telepathy to control the Metroids, allowing them to successfully breed and control them. Once she was destroyed, (twice) the Metroids were a lot harder to produce, and the Space Pirates had to invent other means. So, yes Nintendoer, that was correct. where is doc? its been over a month. I didn't know that the comments on blogs could not exceed 200 per page. 1. Doing a trick to switch from high jump boots to the beams an select them quicly resulting in the Ice, Charge, Plasma, Wave, And Spazer beam to be selected all at the same time. 3. Shinesparking constantly through sector 3 (the water one) after obtaining the gravity suit upgrade. They basically say you're a good player. 4. Spiderball Guardian Or spider Guardian because that's what the scan entry says. 5. Arguably you don't "need" any energy tanks so the answer is Morphball, and bombs, varia, and gravity suit, 1 missle expansion, space jump boots, ice and plasma beams, and that's it. So 8%, right? #5 your missing one item. It's the Power Grip; and the only reason you need it is because a vital path in Norfair is blocked until you get it. You also need to get the Plasma beam (unknown item at the time) for this same reason. Other than that, your correct! 2. In Metroid Prime 3, what is the first power-up you get that no other Metroid game has? 3. In Metroid: Other M, what is the only power-up you get that Adam doesn't "authorize" for you to unlock? 4. In Metroid 2, in which area do you find the Varia suit? 5. In Metroid Prime, what is the name of the charge combo for the plasma beam? Samus says, Any objections, after Adam is AFK and unlocks the space jump and screw attack while she also enables the gravity feature of he suit after the confrontation with Adam. 3. There's actually 4 IIRC: Space Jump, Screw Attack, Gravity Suit (called Gravity Feature in-game) and Power Bombs. wtf did doc really died is this a joke??? For the first question, are you asking what areas have secret energy tanks? Because all of them do. Tourian included. The Grapple Lasso is the first one Samus gets that is not in any others. Man! I missed some fun trivia! Stupid work!!! The Varia Suit is in Area 2. Sorry for cluttering with comments. I should have put all my answers in one comment. No doc didn't die. Or if he did, no one here knows about it. It's just trolls... they started that rumour and then started all of the black people crap. oye man... ya tiene bastante tiempo (mas de un mes) que no has posteado reportes ni nada. me gustaria saber como va esto... estoy un poko impaciente... SALUDOS Y EXITO!! Just ignore the trolls and have fun with the Metroid trivia until DoctorM64 comes back. It's a good way to pass the time. I'm sorry, shoulda made #3 more clear. I forgot about the space jump/screw attack, gravity suit and power bombs. What I meant was what upgrade do you actually find, and not unlock? and #1, I meant the specific locations of the "hidden" energy tanks. #'s 2 and 4 are correct! Still flawed because there are two. The diffusion beam and the seeker missiles. What is going on with this blog? The last entry just vanished? Liverpool gonna make a huge comback next season in the EPL. What do you guys think??? I heard the whole site was experiencing technical difficulties and had to temporarily delete the most recent posts.